​Since I attended jr. high at Heights, I have filled backpacks to send to Liberia. My family always has so much fun going to the store and picking out special things for the child who receives the backpack that we fill. I knew that the backpack was prayed over and filled with love, but I had no idea how much a simple backpack could impact a child, their family, their village, and even their country. The villages we visited believed in the muslim faith as well as relying on the “power” of witch doctors and voodoo. We were only welcomed because we had the backpacks as a gift to bring. Almost all of the babies seemed to have necklaces that had been given to them by the witch doctors for protection. We were able to talk with the mothers about how Jesus is the only protection and hope that they need. Trading Bibles for these bracelets we were able to see the freedom that comes from the cross in action. Even though it was a simple act of taking off a bracelet, we know that it opened doors for God to work in the hearts of these families and bring the people to Christ. Because of these backpacks, we were able to be welcomed into villages where other Christians were not allowed. Because of these backpacks, kids were able to hear the gospel and God will use them to be salt and light in their villages. God loves the people of Liberia and through the distributions we get to play a small part of sharing God’s love and mercy! ​There is a truth that I have learned after all of my trips to Liberia, Africa…love is universal! The cultural differences between Liberia and the U.S. are about as vast as you can get. When we travel deep into the bush, we are entering villages that have never even seen a white person. Often we are greeted with wide eyes and screaming children. Our last stop this year was at a little village with the Vai people. This was in an area covered with Voodoo and Witchcraft and you could feel the darkness right when we stepped off the bus. When I walked up to a group of little kids there was a tiny boy, maybe 2 at the oldest, who started screaming and running away. I can’t describe the feeling I got, but something in my heart just longed to love on this little boy. I kept my distance but also my eye on him as our time went by. As I was watching him, a group of kids came running by and trampled over him. He fell to the ground pretty hard and immediately started crying. I rushed over and instinctually scooped him up and started rocking him while cleaning all of the dirt off of his legs and arms. I felt his little body go from tense to just melting as he laid his head on my shoulder. As I was holding him I couldn’t stop just praying on him and pouring all the love I could on his little life. The rest of the time we were there he was glued to my side. We played together and laughed together, all the time I was either holding him or walking holding hands. The ladies in the village kept laughing and telling me that he was going to want to go home with me, they were shocked at the way he was acting with me. I left that day watching him waving and smiling and realizing that THIS is why Jesus says that we are to love Him and love people. What do these things have in common….LOVE!!! I think Jesus knew that love is something that we have the power to give and master and that can ultimately change someone’s life! ​We had just finished a distribution in a village that had not received the word of God. It went really well and it was very similar to many of the other distributions. I did not know the real impact of what we just did until we had left the village and we were talking with the contact person that took us to that village. He told us that he had been trying to get in to that village for years to share God’s word and they would not allow him to do so. He even said that when people from that village pass his orphanage that they turn the other way as to not even look at it! Since we were bringing the backpacks for the children, they allowed us to come! They even allowed us to share God’s love and to share the story of Jesus! We were able to pray with them and bring people to Christ! This would not have been possible if we were not bringing the backpacks for the children! 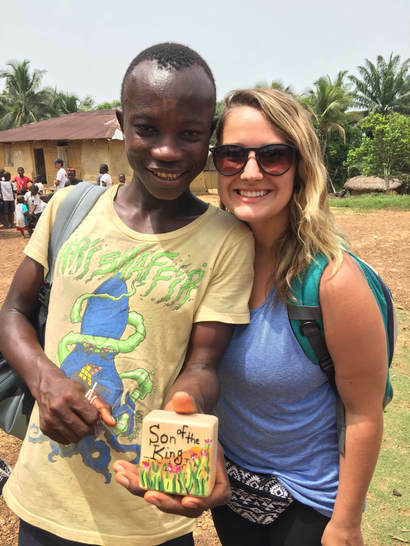 This is a great example of how containers of hope and these backpacks are a tool to share the love of God with the country of Liberia and bring people to Christ!